What better way for kids to learn about aerodynamics than by building protective containers for eggs and throwing them off a balcony? That was the philosophy behind an engineering activity at Camp Kuratli’s first ever STEAM camp, held July 3-7, in Boring, Oregon. Camp staff ended up telling the kids if their egg didn’t break, they were allowed to go back to the balcony and chuck their egg into a trashcan below. While this might sound like something out of a science class, it’s actually part of an elective campers sign up for. 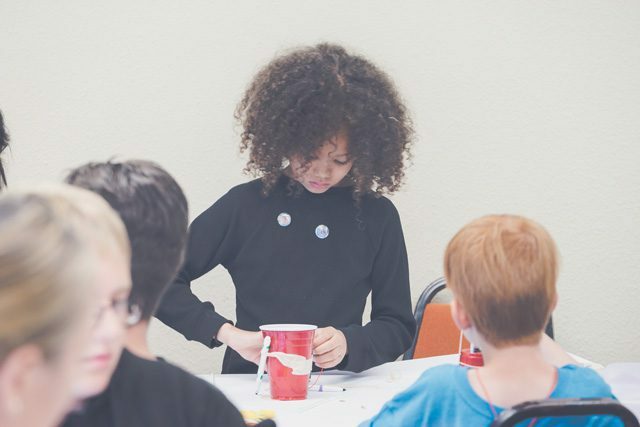 After realizing not all kids love sports, the Cascade Division tried something new: embracing education through science, technology, engineering, the arts and math (STEAM) as camp electives. After facing some initial pushback from corps who thought the change would mean kids would spend camp in the classroom instead of swimming or climbing the rock wall, Hamilton explained the STEAM programming was simply a change in elective choices—the traditional camp elements would still be there, too. The result? Higher attendance than the division’s traditional Salvation Army camps. Campers participate in STEAM programming. Hamilton, who studied engineering in college, wrote to the president of the local chapter of the American Society of Civil Engineers explaining the vision for the camp, and it resulted in members coming out to lead a class, purchase supplies and offer financial support. In the STEAM electives, these opportunities look like coding, photography, video editing, sculpture, dance and building structures out of knock-off Legos under the guidance of devoted mentors. Territorial Youth Secretary Major Bob Louangamath experienced how the youth responded to the STEAM programming firsthand. Cascade Division youth built structures out of Lego-like bricks at Camp Kuratli. He sees the potential for STEAM programming as a way for The Salvation Army to try something different, like it has in the Hawaiian and Pacific Islands and Guam Division. HiPac first rolled out STEAM programming at its camps in 2015 after seeing a need when Hawaii’s schools were ranked among the lowest scoring in those areas, and in the three summers of it, more than 1,000 children have received certification of completion for the Army’s various summer-long STEAM programs, according to Captain Michael Stack, Divisional Youth Secretary.